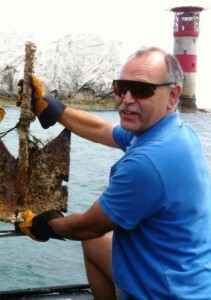 Your skipper has been diving since the late 1960’s and knows the wrecks and reefs in the area, whether diving in the western Solent, off the south coast of the Isle of Wight or mid Channel. Unusually, not only has he dived nearly all of these wrecks, he has also undertaken very detailed research into their history and circumstances of loss. The result is his wreck book South Coast Shipwrecks off East Dorset & Wight 1870-1979 available through www.southcoastshipwrecks.co.uk. If you want to know more about any of the wrecks the skipper will be pleased to tell you. Your safety is paramount when diving from Wight Spirit. If for any reason you feel unwell after a dive or have reason to be concerned about any aspect of the dive – tell the skipper who will invariably advise you to breathe oxygen, a supply of which is kept on board. There is no charge for this! The skipper will assess your condition and act accordingly. This normally involves informing the Coastguard, talking to the diving doctor or, in serious cases, requesting helicopter assistance. 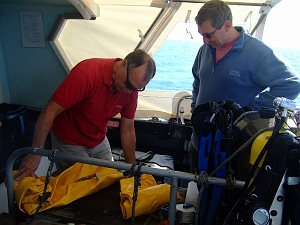 Skipper Dave Wendes – preparing lifting bags, centre, and recovering the boat’s anchor lost 20 years previously. If conditions are rough or foggy, such that your safety may be compromised, the trip may either be cancelled or amended – the skipper doesn’t want to be out there when it’s rough any more than you do! The final decision is made by the skipper – often, strong winds which are forecast do not materialise, or pass through earlier or later than predicted. A moderate breeze with a large spring tide may rule out diving, whereas a strong breeze on a good neap tide may permit it. A dive might go ahead south of the Needles but a similar dive the same day off St Catherine’s Point might be too rough. These are factors your skipper takes into account in determining if a dive should go ahead or not. Thick fog, where there is little or no prospect of reasonable visibility, usually means the dive is cancelled. If I can’t see your SMB’s then it’s not safe. Divers should avoid sites that are unsuitable for their level of fitness or experience or which are in shipping lanes or busy fairways. Assistance will be offered to help you kit up before the dive and to de-kit afterwards.